Life and the economy permeate our thoughts and daily decisions. That is what the game is about. The economic models that we live by are threatening our lives, through ever more numerous personal, social and environmental crises. Therefore, a human needs’ approach, the new framework proposed in the game, restores balance by putting life above the economy. This game is inspired by the book, “Human Scale Development: an option for the future” by Manfred Max-Neef, Antonio Elizalde and Martín Hopenhayn. It is downloadable free here and is considered by the Cambridge Institute for Sustainability Leadership (CISL) to be one of the top 50 Sustainability books. In addition, this exciting initiative to create a game based on ideas of an economy of human scale, has won it the Camargo national prize in the category of sustainability, “Humanidad y Medio” (Humanity and Environment) in Spain. There are many adjectives to describe the game: fun, transformative, educational, entertaining, reflective, strategic, interactive and friendly. It is great for families and people of all ages, starting with children from the age of 10. 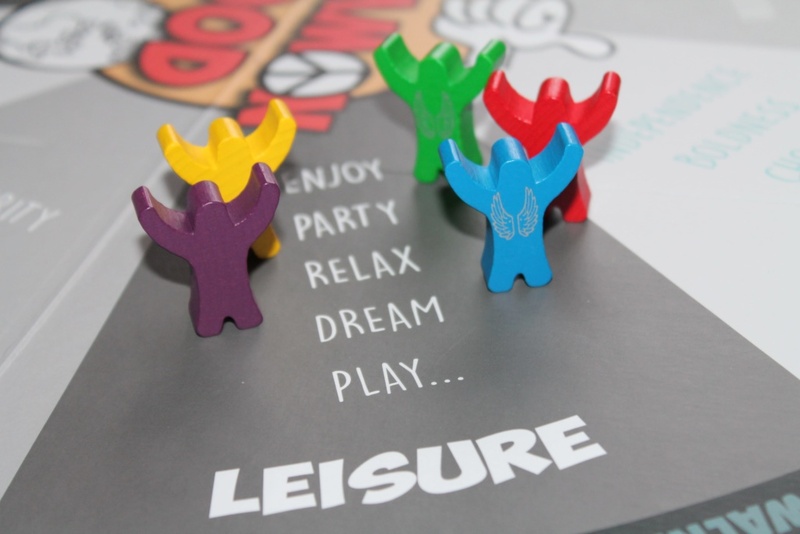 In a lively and stimulating way, the game elicits our creativity, innovation and transformation. 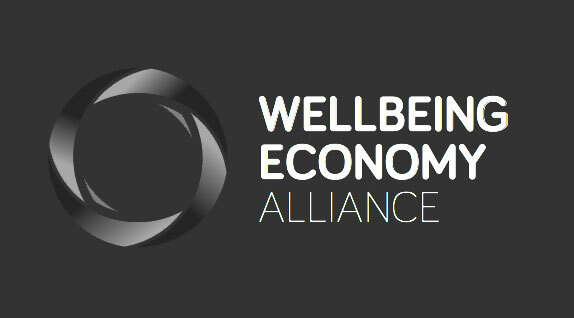 As such, this new paradigm that we call the wellbeing economy, responsible wellbeing, buenvivir (good living), transition and so on… can emerge more rapidly. 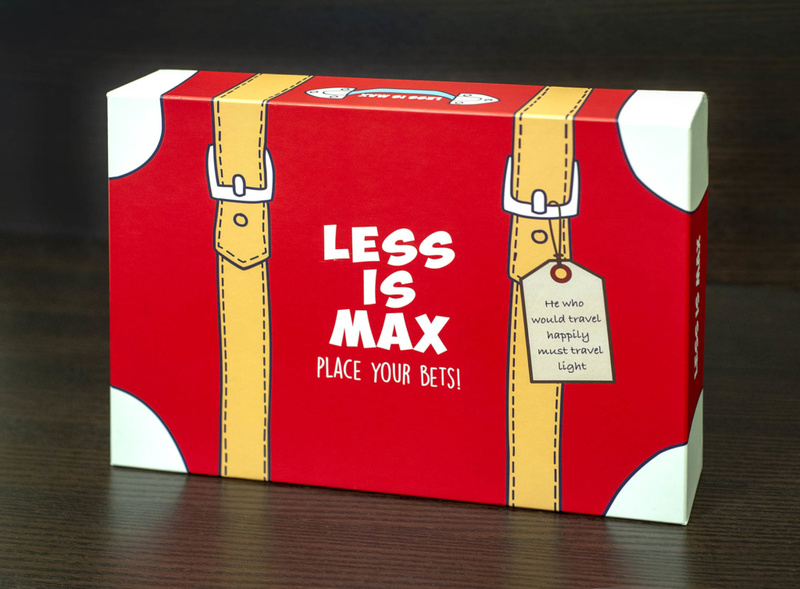 Less is Max is a board game for 2 to 5 players (or even teams). The declaration around the edge of the board highlights the philosophy of our journey of life. It provides the context for the game as a metaphor of our lives. The object of the game is to satisfy the nine fundamental human needs – subsistence, protection affection, understanding, participation, leisure, creation, identity and freedom – through the wings that we collect on our journey. There are 72 cards, of which 12 are surprise cards. These can be pleasant or unpleasant, as happens in daily life. The key to the game lies within the cards. In the first actions they reflect our feelings, thoughts and actions. To bet or not to bet, that is the question. Therefore, we must bet, or not, on how much of our life, ‘cronos’, we are willing to risk. 20 ‘cronos’ coins are allocated to each player. As the game unfolds we find ‘wings’, that satisfy our needs, or ‘weights’, that drag us down and away from them. We also see through our decisions that the ‘suns’ we contribute to the common good begin to shine, and by contrast, the ‘poisons’ of our bad choices begin to erode life. And for that life to continue, if there are poisons in the common good the game cannot be won, even if the nine needs are satisfied. So, the underlying philosophy is that winning is about not harming others: live and let live. We find an increase in paradoxes and contradictions in this global society and in our daily journey of life. As a result, these are reflected in what we feel, think and do. For me, a paradox is a signal to stop and when we examine it carefully it often contains flashes of truth, reality and meaning. However, most of the time we ignore them and in doing so lose useful and wise insights. 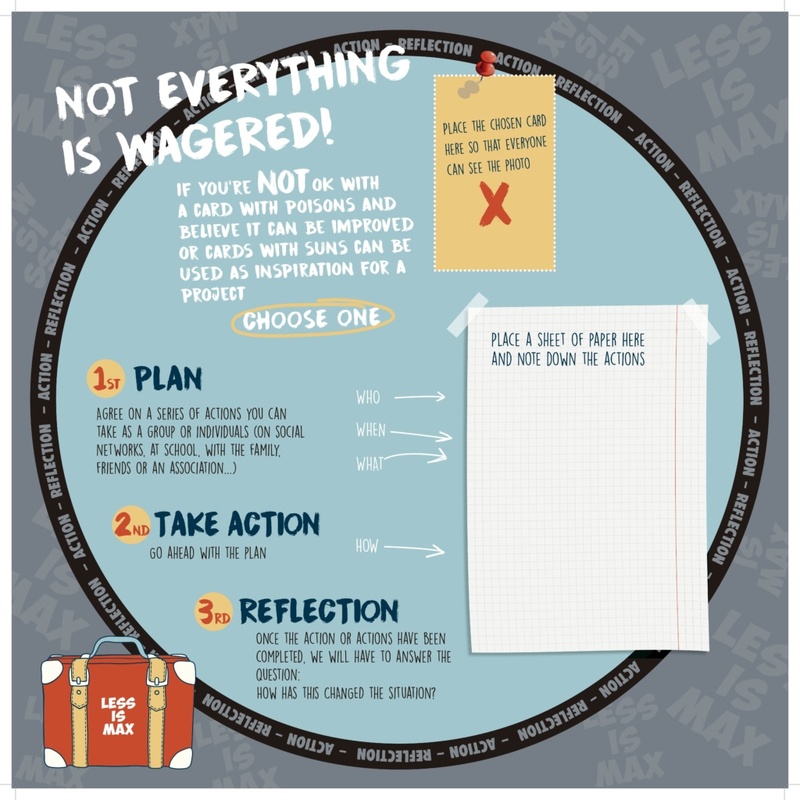 When playing “Less is Max” and betting our time on this or for that, we may experience some contradictions and paradoxes in our behaviour and this is reflected in our actions in real life. Hence, the game encourages us to develop paradoxical thinking. Paradoxes reveal to us that the ideas behind them, or rather the contradictions, are important and we should not ignore them. If we do not avoid them they allow us humans to feel, we become wiser by understanding them and they can help us to discover our deepest creativity and to build the world we desire. “This game is wrong! It’s easy to get affection here but not in real life!”, 14-year-old secondary student, IES Valle de Piélagos, Cantabria (Spain). “It deals with topics that touch us and affect us”, Secondary teacher at IES José Hierro, Cantabria (Spain). “I’ve learned and it’s more fun than copying.”, 11-year-old secondary student, IES Ría San Martín, Cantabria (Spain). 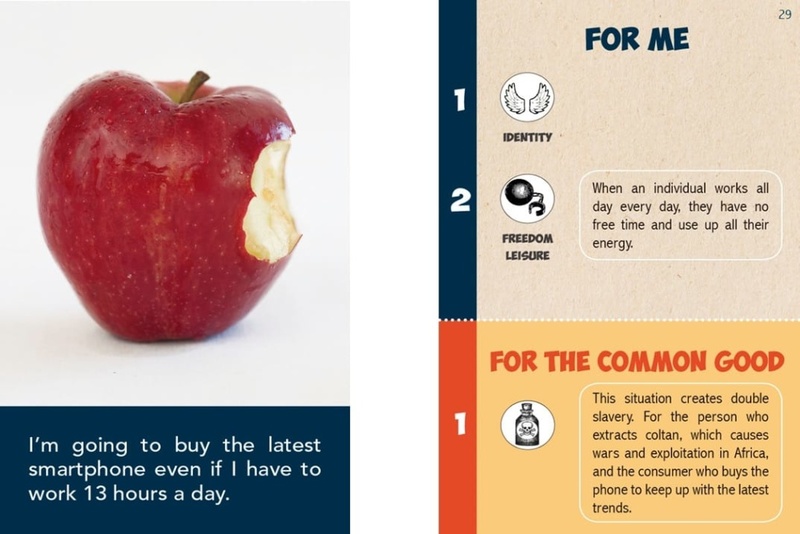 At the 2017 NESI Forum, Tessa Wernink spoke of the invisible hand that runs our market economy, whereupon we have lost connection with what is behind the products we use every day. Planet Earth’s resources and people like us, that feel and have a life worth living, lie beneath those products. That disconnection is also making us lose one of the tools that make us most human; empathy. In addition to empathy, emotions and feelings are being threatened by a new techno-optimistic narrative based on the purest rationality that wants us to disconnect from the indissoluble pairing of ‘feeling-thinking’ that makes us so human. Even online games are supplanting people for avatars. Playing “Less is Max” together gives us the opportunity to be with and see one another, and so encourages relationships, reflections and debates among equals. Ultimately, it is a process that leads to inclusion, the opposite of that disconnected invisible hand. A secondary student who played the game said that in addition to helping him learn, it helped him to socialize in class. However, we cannot rid ourselves of emotion. As the neuroscientist Francisco Mora says, emotion is the energy that moves the world. The brain can only learn when there are emotions. The creators of the game collected testimonials, after playing it with more than a thousand people. These showed the connection between playing and learning, which is clearly seen in our mammalian relatives. Johan Huizinga, author of the classic book “Homo Ludens; A study of the play-element in culture”, said: “Play casts a spell over us; it is ‘enchanting’, ‘captivating’”. I would add, playing this game allows us to feel. It can help us reveal our hearts so that we remain human. “Ah! I understand! It’s a game to learn to be happy!”, 15-year-old, philosophy student in secondary school, IES, Sta. Clara, Cantabria (Spain). “It is excellent for reflection. For children of younger ages, it’s ideal for talking with the family about values. It’s good for learning about needs that are important in life”, University Professor, Cantabria (Spain). “Here, teachers need to learn more than the students!”, Secondary teacher, IES José del Campo, Cantabria (Spain). In the game “Less is Max” the focus is on that framework; the nine fundamental human needs. If the rules of this new framework are accepted, our awareness and our thinking change, as happened to that student. It is like the flying fish which, when it is out of the water, is able to see another, different. perspective from those that are still under the water. This happens to people in a similar way. We live submerged in a paradigm and only when it begins to shift, due to the successive crises that happen within it, does the moment arise when we begin to question it. Then, Critical Thinking occurs, and this is the beginning of our path to being wiser. Using this new tool, we may begin to see the different relationships that occur in a system; systems thinking. Finally, we can stop to wonder what these paradoxical contradictions within this complex Planet-Society duality are telling us. In a moment, we may glimpse a flash of truth thanks to paradoxical thinking. These three kinds of thinking can emerge through this game. 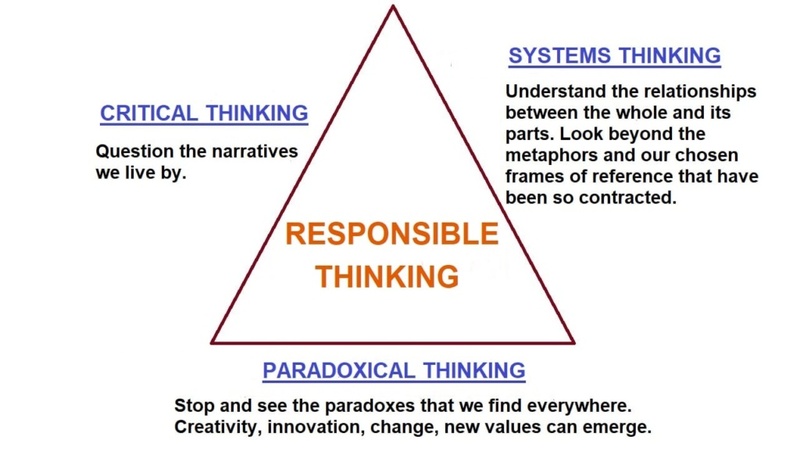 The concept ‘responsible thinking’, in reference to the responsible wellbeing approach, could be born from those three kinds of thinking. The idea of these tools of understanding being used and developed in schools is very compelling. Johan Huizinga also reminded us of the story behind the world ‘school’ in his book “Homo Ludens”. It originally meant ‘leisure’, but it has now acquired precisely the opposite meaning of systematic work and training, as civilization has increasingly imposed restrictions on the free disposal of children’s time. Maybe we should change the framework and return to its origins, as “Less is Max” tries to do. 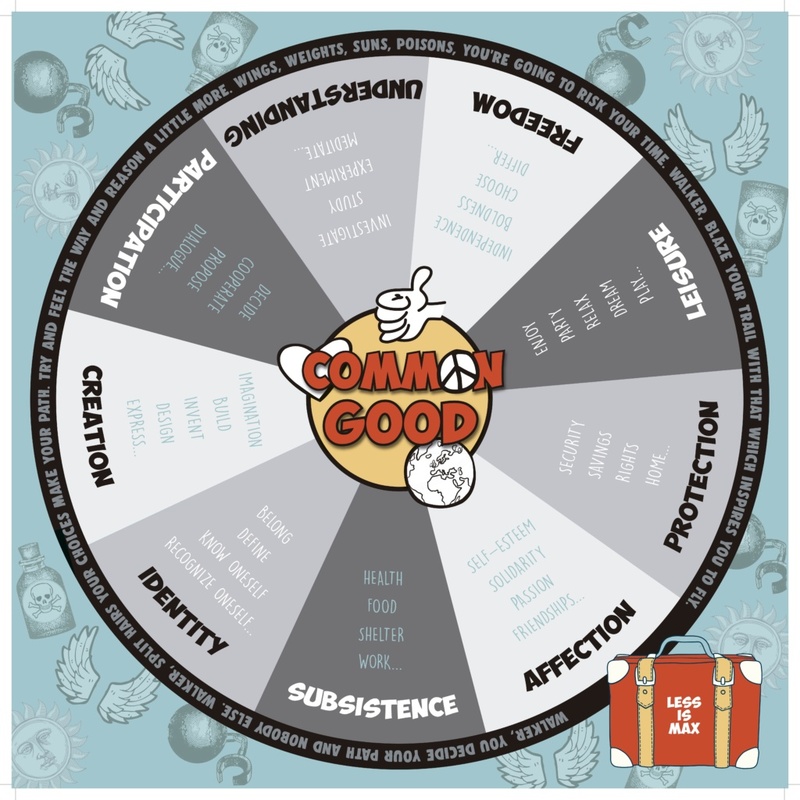 This game offers us a playful framework in which to rethink the social and environmental issues that concern us as humans and brings us back to that first etymological meaning of school, “leisure”; for learning and to make us wiser. “It makes you see that what you do has consequences and that the world is bigger than the surrounds of your own life.”, Nursing student, University of Cantabria, Spain. “It’s cool and teaches you that with less, better things and more things are done than with more and worse things”, 11-year-old student, IES Valle del Saja, Cantabria (Spain). “It addresses the problems of humanity from a playful point of view. Students have a good time and they realize what is needed and how they can collaborate”, Secondary school teacher, IES Vega de Toranzo, Cantabria (Spain). Finally, after getting excited playing and learning, it seems that the game comes to an end. But no, we lack the experimental part, the active part, especially in the near or local issues that concern us. The surprise comes when you rotate the board and it is not blank. Belén and Carmen have thought about synergy, which is considered a fundamental need by Carlos Mallmann. This humanist scientist, according to Max-Neef, was the first person to have intuited the concept of separate needs and satisfiers. The back of the board is the most transformational part, the one that puts our emotions, the energy that moves the world, and our thoughts into a framework of realising the common good and human needs. Depending on the context – family, school, organizations – you can design a plan of action-reflection on a specific card topic that you choose. This can be inspiring, with many wings acquired, or it can be something poisonous, acquiring weights that drag us down. In the latter case, we can reverse the situation by creating something to change it. Many primary and secondary teachers have been surprised by the initiatives their students have taken when they are free of the rules of uniformity. There are plenty of initiatives with an action approach, for example: “Service-learning” in many schools around the world; “Changemaker schools” that encourage their students to be agents of change; “Design for change” where students become a kind of superhero that tell us they do not need permission to make the world a better place… Recently, we’ve seen the movement about the climate crisis created by Greta Thunberg. It resonated in Australia’s schools in a similar way to the civil disobedience Extinction-Rebellion movement in other countries. We could say that the ‘creativity’ need has many wings. Finally, Johan Huizinga stated in “Homo Ludens” that ‘the eternal gulf between being and idea can only be bridged by the rainbow of imagination’. The B-side of the board gives us an experimental platform upon which to imagine and create the world that we want. If he has ethics, then his value is = 1. If it is also intelligent, add a zero and its value will be = 10. If it is also rich, add another 0 and it will be = 100. If above all that is also a beautiful person, add another 0 and its value will be = 1000. The story above (that may be truth or fiction) of the founder of algebra, Muhammad ibn Musa al-Khwarizmi, offers a relevant frame of reference for this game. “Less is Max” is, above all, globally ethical and touches on all the educational aspects of a wellbeing society. In addition, it has been intelligently designed by Belén, Carmen and others who all collaborated to bring it into its present form. The game is still in development. They are looking, potentially, to create a card design for older people. There is tremendous wealth in the game, that is not measured by quantity but by the quality of its results. And finally, there is an intrinsic beauty in the holistic way in which it integrates the human being. In my opinion, it is a game that is worth the ‘1000’ and which could help us differentiate two concepts that are not equal; value and price. That this small NGO called “A volar, descubrir, jugar y crear” (To fly, to discover, to play and to create) from Santander in northern Spain, can flap its wings to the “Max” and make a great anti-cyclone appear that extends and illuminates with its ‘suns’ all parts of the world through this transforming game, which can sponsor progress towards the common good and true human needs. The Spanish version of the game has already flown to Chile, to Manfred Max-Neef’s home, and he has shown great appreciation for this wonderful initiative. 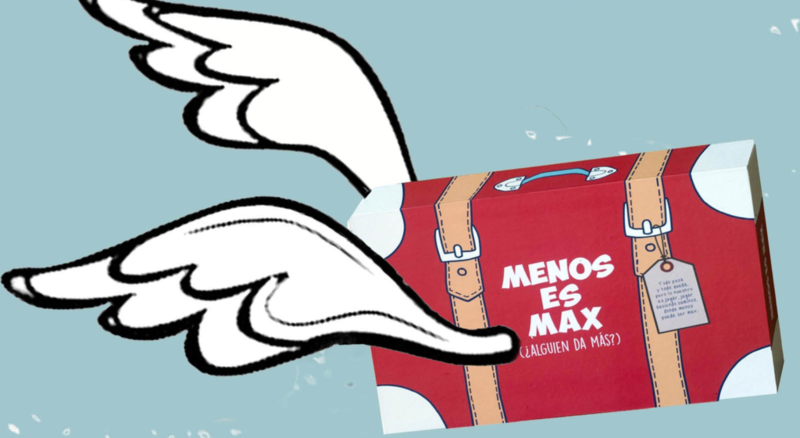 Interestingly, the name of the game uses wordplay in Spanish, “Menos es más” (Less is more), changing the last word “más” for Max as a tribute to the “barefoot economist” and Right Livelihood winner, Manfred Max-Neef. This alternative economist continues to ethically frame a new economy. In his opinion, economics should be based on five postulates and one fundamental value principle. Postulate 2. “Development is about people and not about objects”. Finally, why not fly further and translate the game into other languages? hello, where can i buy this game ? It’s not available in English yet, but hopefully one day soon! I am a positive psychologist from Iran. I am interested in translating this game to Persian. what should i do and how can i buy it from Iran? You can find all the information to buy the game at https://menosesmax.org/en/. For translating the game, please contact the authors at lessismax@gmail.com. Thank you!